Across the US, public and private lands are in need of better management to: (1) eliminate catastrophic fires, (2) promote new growth, and (3) maximize carbon sequestration. The status quo exacerbates wildfire risk and adds harmful CO2 and methane emissions. To ensure the health and safety of our forestlands, we need to maintain and enhance management practices. Biomass power can be an important element of forest management. BPA members purchase forestry residues, agricultural byproducts, and other organic materials to use as fuel for power generation. Importantly, biomass facilities provide a market incentive to clear brush and dead trees that otherwise have little or no value. Many federal lands, particularly in the West, are in urgent need of clearing. More than 100 million trees across California alone—many of which are located in the federally-managed Sierra, Stanislaus and Sequoia National Forests—are dead, due to continued drought and bark beetle infestation. As many as 90,000 acres in the state qualify as “high hazard zones,” with trees ready to topple over or catch fire, posing significant risk to residents, tourists, homes, and infrastructure. Some of the hardest-hit areas have as many as 14,000 dead trees per square mile. On top of that, the U.S. Forest Service budget that could contribute to clearing out lands in the highest risk areas is increasingly consumed with fighting fires. In 2017, more than $2.5 billion went toward fire suppression, a number that is projected to rise over the next decade. 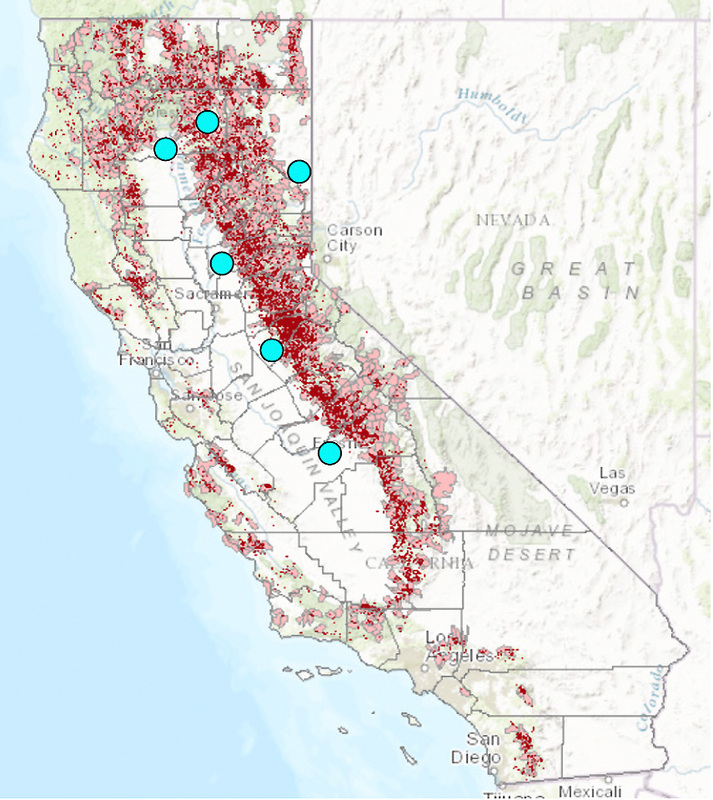 Blue dots: Biomass facilities required through California’s BioRAM program to take on increasing levels of high hazard fuels. The U.S. Forest Service and the biomass power industry have an existing, strong partnership in place through an MOU to promote the use of energy from wood. Fully funding the Forest Service will enable the agency to expand its public-private partnership to work with biomass power facilities to remove hazardous fuels from federal lands in California and elsewhere. 1. Identify and document areas and lands with hazardous fuels that are at the highest risk of fire—whether wildfire or open pile burning. 2. Verify that there is no higher value use for the fuel, so that the program does not cause market distortion. 3. Share the cost with biomass facilities, up to $10 per bone dry ton (BDT), for transportation of fuel to a biomass power plant, with payment to the plant.